Recognized by its more common name "tea tree", Melaleuca has been revered for its helpful properties, especially for the skin. Composed of more than ninety different compounds, Melaleuca has limitless applications. Melaleuca alternifolia. For aromatic, topical, or dietary use. 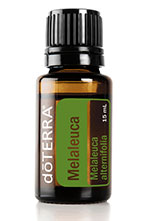 Uses For occasional skin irritations, apply 1 to 2 drops of Melaleuca essential oil onto affected area. Combine 1 to 2 drops with your facial cleanser for added cleansing properties, or apply to skin after shaving.